Info "Turn your wrist to open, and do the reverse to close it." 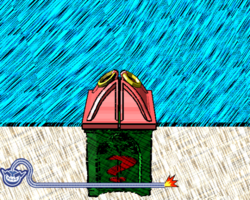 Coming Unhinged is one of Orbulon's Microgames in WarioWare: Smooth Moves. The objective is to either lift the controllers vertically to lift up the hinges or lay them horizontally to keep the hinges flat. The goal depends on the difficulty level. 1st level difficulty: The player needs to open the jack-in-the-box. 2nd level difficulty: The player needs to open the box and wait for the fireflies to get in, and then close it. 3rd level difficulty: The player needs to flatten the drawbridge to let the horse and cart pass, and then lift the bridge for the boat. This page was last edited on February 20, 2018, at 18:30.